A global community. A way of life. The best party at sea. Holy Ship! has released the highly anticipated lineups for each of its two sailings in January 2019. Presented in collaboration between HARD Events, Cloud 9 Adventures and The Bowery Presents, the iconic dance music voyage offers a scene-leading lineup for its twelfth and thirteenth editions. Norwegian Cruise Line will once again host ShipFam aboard the luxurious Norwegian Epic, with the four night 12.0 sailing January 5-9, 2019 immediately followed by the three night 13.0 sailing January 9-12, 2019. From dusk to dawn, poolside to beachfront, Holy Ship! continues its legacy of delivering forward-thinking electronic music programming in unmatched oceanic locales. Attendees will chart their course from Port Canaveral on the crystal-blue seas of the Caribbean with a soundtrack provided by some of the world’s most in demand artists. While aboard, fans are immersed in Holy Ship!’s unmatched energy defined by theme nights, artist-led activities, and rare back-to-back sets which unite genres and welcome the envy of those who miss the magic. A small deposit of $250 USD per person reserves a spot on either of the Holy Ship! sailings, allowing fans many months to spread out remaining payments into payment plans for no additional fee. It remains the welcoming spirit and spontaneous mischief of the famed ShipFam community that gives Holy Ship! its reputation. Whether embarking on their first sailing or returning as a sea-weathered veteran, each attendee is granted entry to one of dance music’s most inclusive and fun-loving crew of party-professionals. ShipFam is the Best Fam and only those who have felt the affectionate embrace of its members and unique yearly reunion will truly know. Only a limited amount of cabins remain and will go on sale Friday June 15 @ 2pm EDT. 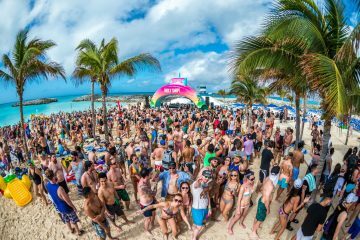 Given that each of Holy Ship’s previous eleven sailings sold out, fans would be advised to mark their calendars!